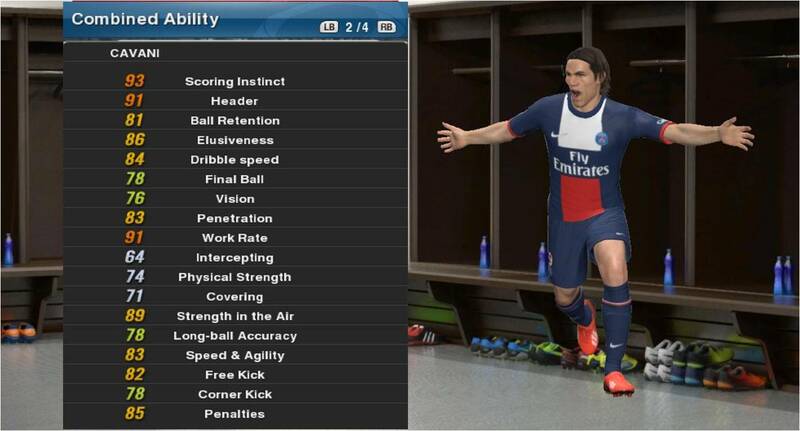 Welcome to PESMastery’s PES 2014 Player Ability Explanation. 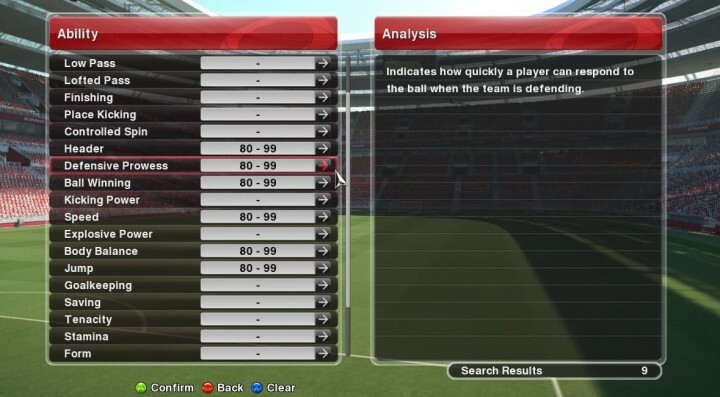 To assess a player’s capabilities, we used to look at the player’s numerical ratings in abilities such as Ball Control, Finishing and Stamina. 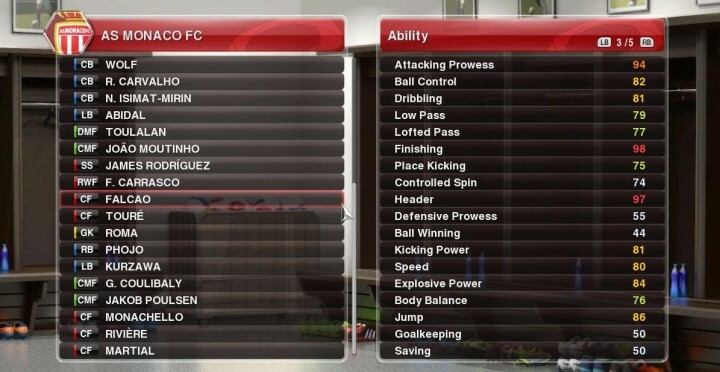 However in PES 2014, a new component, ‘Combined Ability’, is introduced. Combined ability aims to summarise the long list of player ratings and present it in a simply, easy-to-digest format for us to make fast decisions on which players to play or purchase. Editing player ability affects combined ability, signifying that combined ability is a summary of player ability. Let us take a close look at what each of the ability represents. Scoring Instinct – Indicates how good a goal scorer a player is. Header – Indicates a player’s ability to get headed shots on target. Ball Retention – Indicates how capable a player is at retaining possession. Elusiveness – Indicates how good a player is when trying to lose his marker. Dribble Speed – Indicates how fast a player is when on the ball. Final Ball – Indicates how good a player is at delivering quality final balls. Vision – Indicates the player’s ability to pick out the game-changing pass. Penetration – Indicates how good a player is at dribbling his way past defences. Work Rate – Indicates how much ground the player can cover during matches. Interception – Indicates how good a player is at cutting out passes played by the opposition. Physical Strength – Indicates how strong a player is when involved in physical tussles. Covering – Indicates how good a player is at providing support for his teammates when defending. Strength in the Air – Indicates how strong a player is when competing for the ball in the air. Long-ball Accuracy – Indicates how accurate a player is when passing over long distances. Speed & Agility – Indicates how sharp and mobile a player is. Marauding – Indicates how good a player is when coming out of his goal in order to defend. Handling High Balls – Indicates how good a player is when dealing with high balls. 1-on-1 – Indicates how good a player is when defending in a 1-on-1 situation. Outfield Skills – Indicates how adept a player is with his feet skills. Consistency – Indicates a player’s ability to perform consistently. Free Kick – Indicates a player’s level of potency from free kicks. Corner Kick – Indicates a player’s ability to deliver quality balls from corners. Penalties – Indicates a player’s level of potency from the penalty spot. This section explains the meaning behind each of a player’s ability. Attacking Prowess – Indicates how quickly a player can respond to the ball when the team is attacking. Ball Control – Indicates how good a player is at controlling the ball in general. Affects trapping and feints. Dribbling – Indicates how intricate a player’s touch is when running with the ball. Low Pass – Indicates how accurate a player is when playing low passes along the ground. Lofted Pass – Indicates the level of accuracy a player commands when playing lofted passes. Finishing – Indicates level of accuracy when shooting. Place Kicking – Indicates a player’s accuracy from set pieces including free kicks and penalties. Controlled Spin – Indicates how much curl and spin a player can put on the ball. Header – Indicates accuracy when heading the ball. Defensive Prowess – Indicates how quickly a player can respond to the ball when the team is defending. Ball Winning – Indicates how good a player is at dispossessing an opponent. Kicking Power – Indicates how much power a player can generate when striking the ball. Speed – Indicates how quick the player is when off the ball. Explosive Power – Indicates a player’s agility and mobility. Body Balance – Indicates how well a player can hold off opponents and keep balance when physically pressured. Jump – Indicates how high a player can jump. Goalkeeping – Indicates how quickly a player can respond to the ball when playing in goal. Saving – Indicates how good a player at pulling off saves. Tenacity – Indicates how well a player copes with fatigue and adversity. Stamina – Indicates a player’s level of fitness and endurance. Form – Indicates a player’s ability to maintain form over time. Injury Resistance – Indicates a player’s level of tolerance to injury. Weak Foot Usage – Indicates how often the player will use the weaker foot. Weak Foot Accuracy – Indicates how accurate a player is with his weaker foot. Stronger Foot – Indicates the player’s stronger foot. With the exception of superstars such as Ronaldo, Ibrahimovic and Messi, each player has one main area of strength, and it will be hard to find truly all rounded players. Searching for someone strong in all areas is challenging, and purchasing them for your team is virtually impossible as well. Thus, recognising the right abilities to fill a specific role in your team is essential. This allows you to buy the right players at an affordable price. Hunting for a target man? look out for players strong in Header, Physical Strength, Strength in the Air and Jump. Need someone to make defence splitting passes? Purchase the player with high ratings in Final Ball, Vision, Long Ball Accuracy, Low Pass and Lofted Pass. Looking for the next dribbling whiz? Core abilities are Ball Retention, Dribble Speed, Penetration, Speed & Agility, Ball Control, Dribbling, Speed, Explosive Power and Body Balance. Want a rock in defence? Focus on Interception, Physical Strength, Covering, Strength in the Air, Header, Defensive Prowess, Ball Winning, Speed, Body Balance and Jump. Scouting for a top defender. Yes it it challenging to find the players with the required abilities at the right price, but that is where the fun is, isn’t it? Have fun scouting, and let me know of the gems you find! I played become a legend for several times, my player was young about 18 years old. At the first, his skill is increasing very fast, but then, after the transfer window and he opened new season, his skill ( attributes) decreased. I searched everywhere, but I couldn’t get answer. Is this because of my player don’t play for several times or is it an error? Please answer ! ! In general, player abilities will increase over time. No matter where you start off with, your player will surely become a superstar after a few years. So I will say not to worry if your stats didnt increase for now, as the growth will resume.